In the Summer I took part in the Open Air Art in the Park Exhibition which happens in Cheltenham ever year. I selected my pictures – mostly acrylics and wrote out tags for them – Alaric my husband made hooks to hang the pictures from on the display grid. .. I can fit more pictures on here. I sold one painting called Vortex which was a green swerl. 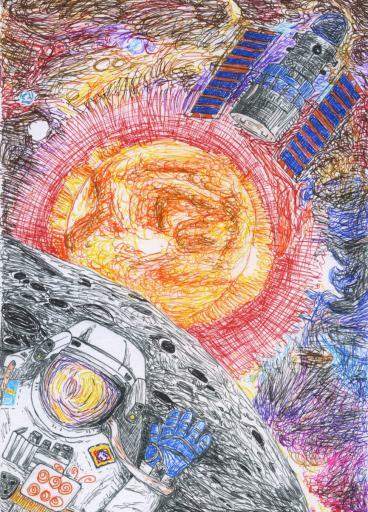 This is my entry to the ESA (European Space Agency) art competition Create Your Space. If you like it you have until the beginning of February (2011) to vote for it. You vote by liking my comment on the ESA image on their Facebook page – here is the link you’ll need to tell you how to vote ;). I hope you all like it. I believe you need to “like” the page before you can vote. I am Sarah Snell-Pym and this entry is linked under the image of Christer Fuglesang’s Space Walk – it is quiet a way down their wall on Facebook. Now I’m having a baby at the end of this month so am not sure there will be much art and craft happening – I hope to be running craft workshops and to do more papier mache possibly learn book binding but mainly I want to finish projects I have already started and find places to sell things as my house is filling up.